Don’t get me wrong. Yes, we all want to be happy. But happiness is such a short-term objective. Nobody is happy all the time. Happiness isn’t even appropriate all the time. The quest for happiness presupposes that it’s a higher value than any other feeling or emotion. It’s not. We need it, but we don’t need it all the time any more than we need sadness, or laughter all the time. I begin talking about this because almost daily I encounter people lamenting how unhappy they are. They incorrectly think happiness is the goal and their failure to achieve it makes them miserable. More miserable than they might have otherwise been if they’d been reaching for something more appropriate. The result? Disappointment and in many cases, increased loneliness. 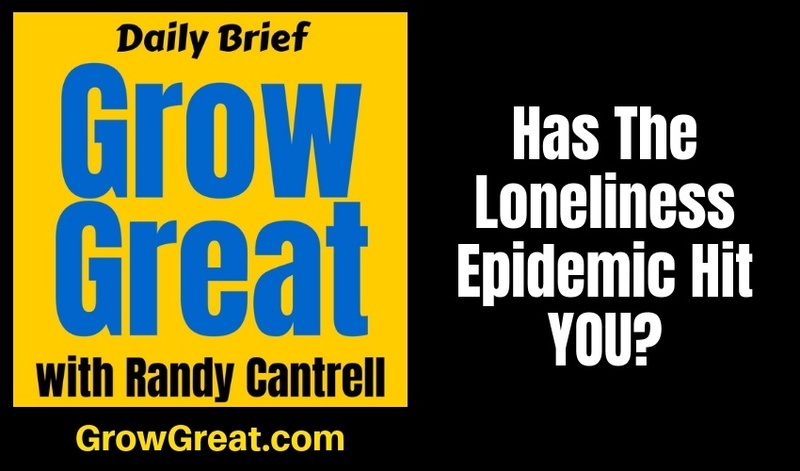 Social media, smartphones, and the Internet are part of a grand irony – we’ve never been more connected to more people more hours of a day, but many of us have never been so lonely! I bring up happiness because it’s such a culturally imposed pursuit – be happy – that we’ve collectively fallen for it. We think it’s a worthwhile pursuit. Maybe THE pursuit we should be aiming for. People chase it. The other day I was reading about how people are buying clothing from online retailers and returning it. Turns out, many people are buying clothes they can’t afford, putting them on, taking photos for their Instagram, then returning the clothes. What makes us happiest and content in life? Is it stuff like clothing or fancy cars or big houses? Nope. Is it more followers on Instagram? Or more listeners to our podcast? Or more subscribers to our YouTube channel? Nope. Nope. Nope. Surveys overwhelmingly show that friends and family are the real prizes. Even though our need to connect is hardwired, some of us are always alone. Conversely, some people who are surrounded by others, still experience deep and pervasive loneliness. So what are we doing? We’re faking happiness and it’s making us more deeply dissatisfied and unhappy! Entrepreneurship is being held up as the end all, be all. It’s the path to happiness. Quit that 9 to 5. Ditch that job career. Start your own thing. You don’t have a side hustle? You’re a moron, a loser. Entrepreneurship is about spending 90% of your time working, chasing, pursuing, hustling. Sleep 4 hours or less, then work, work, work. It’s what all the cool kids do. Don’t you wanna be cool? Don’t you wanna be able to call yourself an “entrepreneur?” What’s wrong with you? Then, there’s YOU. And me! People out here doing real stuff. Every day. People churning out the work, making payroll, managing inventories or manufacturing, managing budgets, putting out fires, building cultures that will perform at the highest level we can possibly influence. Some days we eat the bear, and some days the bear eats us. We’re surrounded by employees, suppliers, stragegic partners, customers, and prospects. But we’re very lonely. Often feeling like we’re serving everybody, but nobody is serving us. Sometimes we feel guilty because we feel that way. So we power through it. But it’s still there. I saw that posted online this past weekend. I laughed, but the more I thought about it the more I realized how true it is. 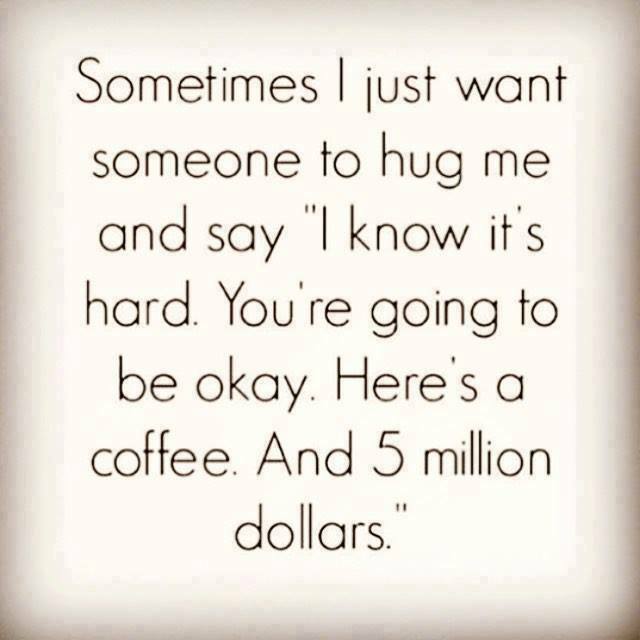 And I don’t mean the $5 million part. Sure, that’d be nice, but the encouragement would be terrific, wouldn’t it? About a year ago I developed a fascination with ENCOURAGEMENT. It directly speaks to the power of loneliness. I’d ask people about a time when they were really encouraged. I noticed something. People would always harken back to some encouragement they received long ago. Nobody – and I mean NOBODY – would mention encouragement that was recent. I wouldn’t say anything. I’d just listen and drill deeper on occasion, trying hard to understand why that particular act by somebody had impacted them so heavily. As I’d listen to people recount the story of a time when they were most encouraged I’d see it in their eyes. A yearning to have that experience again. A craving. A strong desire to not be so alone. A strong desire to have somebody recognize the difficulties of their life and somebody to express belief in their ability to endure it, or overcome it. Perhaps an even stronger desire to have somebody do for them what they remember being done years ago – somebody who cared enough to go the extra measure. To challenge them in the most positive way. Not surprisingly, feelings of isolation can have a serious detrimental effect on one’s mental and physical health. Loneliness can be a contributing factor to heart disease, Type 2 diabetes, arthritis, among other critical diseases. Lonely people are also twice as likely to develop Alzheimer’s disease. At the root, isolation compromises immunity increases the production of stress hormones, is harmful to sleep, and impacts cognitive abilities. All of this feeds chronic inflammation, which lowers immunity to the degree that lonely people even suffer more from the common cold. Loneliness can be a chronic stress condition that ages the body and causes great damage to overall well-being. There are many prices paid by our loneliness, compelling reasons to conquer it. But I’m focused on it for two main reasons. One, because of the total negative impact it has on your life and every part of your life, including your business. Two, because you’ll never be able to grow as great as you could – never be able to grow your business as great as it could be – if you’re lonely. Coupled with that, you’ll never climb higher by yourself as you can with some help. But I also think of the people whose lives can be enhanced by your also helping them overcome their loneliness! And people whose lives will be better if you’ll just let them serve you. The intrinsic benefits to all of us are immeasurable. To know we have others who care enough about us to help us, to know we have others who trust us enough to let us help them – can you put a price tag on that? I can’t. I can’t properly calculate the value of that any more than I can calculate the value of my wife or my family. Can you? The challenge is how to fix it. We’ll talk about that tomorrow. For now, I’d like to give you a virtual hug and encourage you to make up your mind to open up yourself – to helping others and letting them help you. To join forces in fixing the loneliness epidemic by finding and implementing a remedy so you can avoid remaining part of it.